Tyler Ashby threw a pair of 45-yard touchdown passes and the Fort Bragg defense kept visiting Piedmont from scoring as the Timberwolves advanced to the second round of the NCS Division 4 playoffs with a 14-0 victory Friday night. Playing on a wet field, Ashby hooked up with Brandon Palmer in the first quarter and then found Ty Vaughan in the third for the game’s other touchdown. Fort Bragg dominated on both sides of the ball. The offense gained 480 yards and ran 68 plays, while the defense held the visitors from the West Alameda-Shoreline League to a handful of first downs. “I’ve never seen a more bizarre game,” T’wolves coach Roy Perkins said. “To watch your team go up and down the field gaining 480 yards and just scoring two touchdowns was stressful. Fort Bragg got outstanding play from its front three — Jacob Clark, Neil Dondaville and Eric Herrejon. Junior running back Zach Smith had the bulk of the Timberwolves’ offensive yardage. He gained 255 yards on 35 carries. Ashby picked up 80 yards on 18 carries.Fort Bragg, the bracket’s No. 5 seed, will next play the winner of Saturday’s game between No. 4 Arcata and No. 13 Moreau Catholic. The Timberwolves, champs of NCL I, will take a nine-game win streak into the game. Their overall record is 10-1. Piedmont ends the season with a 5-6 mark. The Dave Filippini-led Tigers are riding a nine-game win streak into the playoffs! The Tigers — sporting the black and orange –are averaging nearly 33 points on offense. 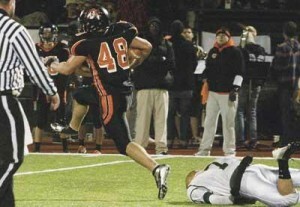 The Arcata defense has given up an average of 15.2 points per contest. ARCATA — An unexpected source got the Arcata High football team going. Then, the usual suspects took over to sink Moreau Catholic. Edgar Madero’s 52-yard kickoff return kick-started fourth-seeded Arcata, which scored 39 unanswered first-half points en route to a 65-27 win over No. 13 seed Moreau Catholic in the first round of the North Coast Section Division IV playoffs Saturday night. And what was going through Madero’s mind as he booked it down the Moreau sideline and into the end zone? It was quite the turnaround for the Tigers, who had just seen the Mariners’ Jason Hinton return an interception 30 yards for a touchdown. But Moreau’s 7-6 lead lasted all of 11 seconds. The unpredictable turn of events was exactly what Arcata needed. Stone had 17 carries for 238 yards and touchdown runs of 16, 27, 28 and 80 yards, routinely going up the middle and breaking loose in the secondary. Stone’s backfield mate, junior Tyler Keil, had touchdown runs — both on toss sweeps — from 13 and 54 yards out during Arcata’s first-half barrage. He finished with 146 yards on just 12 carries. All of the Tigers’ yardage came on the ground, with quarterback Chad Blickenstaff’s lone pass being the interception return in the first quarter. Hinton added two touchdown runs of 60-plus yards in the third quarter. He finished with 133 yards on the ground on 12 carries and caught two passes for 42 yards. With their 10th consecutive win, the Tigers advance to the Division IV quarterfinals and will host No. 5 seed Fort Bragg next Saturday at the Redwood Bowl at 7 p.m. Fort Bragg beat 12th-seeded Piedmont 14-0 Friday night.